Quick!!! 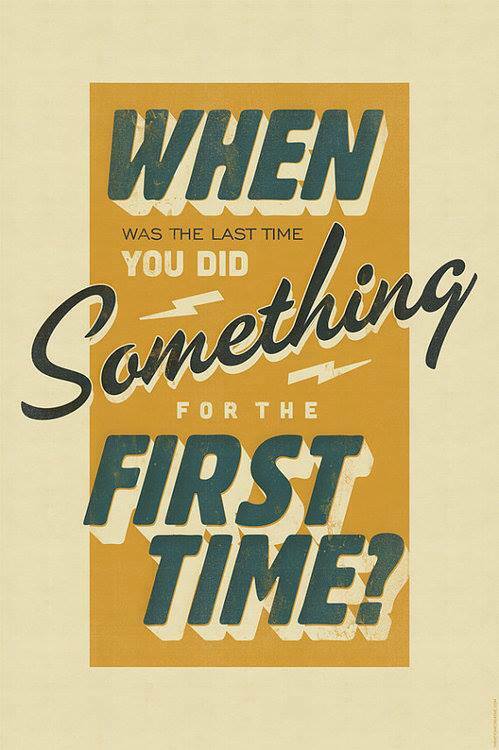 When was the last time you did something that you’ve never done before? Wasn’t this an exciting part of our childhoods? We would plan and dream up the next wonderful experience to take on and feel as though we were on top of the world! But it doesn’t have to stay this way. You could actually step out of your comfort zones and do something brand new!! Think back at how exciting and nerve wracking you felt when taking on a new experience. Your heart beats faster. You get a bit nervous and tingly. You fret about what it will entail and what could go wrong. But it’s all exciting!!! We need to LIVE, for crying out loud! But how do we do this; when it’s so foreign to our lives? Get out a piece of paper and pen/pencil and draw a line down the middle. On the left side, write down all the things you would like to “start doing”. Don’t get caught up in logistics and dilemmas; just write down as many as you can in a minute’s time. On the right side, list all of the things that you’d like to STOP doing. You know, like “stop eating sweets late at night”; “stop complaining to your spouse/friends”; stop watching tv in the evenings”, etc. Now, just start with an item on your list and start or stop that chosen task NOW. Keep adding to your list and make sure to choose at least ONE of the listed items every single day. For example, START; walking a mile every day, STOP; texting in your car…etc. Doesn’t that sound invigorating? I think you will be pleasantly surprised at the sheer joy it brings into your life. I don’t doubt that you will be more energetic because of this. I bet that your brain starts to generate new and exciting ideas and plans because of this. What do you say? In order to get something you’ve never had before; you’ve got to do something you’ve never DONE before!! Previous postLemons Can Be Your Best Friends! !